Mariana Knoedt is no stranger to working in male-dominated industries. At university in her native Brazil, 70% of her food engineering colleagues were men. In other classes, it was more like 90%. After five years in consulting, she relocated to France and, together with her husband, embarked on a full-time MBA program at HEC Paris. At HEC, she was put in touch with an HR representative from Microsoft’s London office. She graduated in June 2016. Three months beforehand, she signed a contract with Microsoft to make the triple jump – changing location, industry, and role – into a tech field dominated by men. “To move from Brazil to this opportunity in the UK, to be accepted to work for a leading tech company, to have the position I have today; I don’t think I would have had this door opened to me if it wasn’t for HEC,” says Mariana, speaking in the lead up to International Women’s Day 2017. According to the EU Commission, only 30% of the 7 million people working in tech in Europe are women. Globally, just 25.8% of Microsoft’s employees are women. That’s down 1% from 2015. HEC Paris is doing its bit to boost numbers of women in tech. In 2016, 33% of its graduating MBA class were women. 17% of the class went into technology after graduation, securing roles at top HEC MBA employers like Amazon, Microsoft, and Google. As part of her final project, Mariana (pictured with her husband below) worked as the CEO of a startup specializing in satellite system technology, helping to raise €500,000 in first-round funds. “The biggest learning for me from the MBA came from having class diversity, in terms of gender, background, experiences and perspectives,” she says. “In tech, we’re in a moment of huge transformation with tech disrupting every industry. I can’t think of a moment where diversity is more important. Under CEO Satya Nadella, Microsoft is making concerted efforts to increase the number of females represented in the company each year. It’s addressing the gender pay gap too. The company states that for every $1 earned by men at Microsoft, female employees in the US earn 99.9 cents at the same job title and level. The first leading tech company to publicly release statistics on the diversity of its workforce was Google. At Google, 31% of employees are women. 24% of Google’s leadership roles are occupied by women. 21% of new hires in 2015 were women in tech. Among them, HEC Paris MBA grad Ashley Bienvenu. She was recruited on-campus at HEC. She now works for Google Express – Google’s emerging online shopping service – in San Francisco’s Silicon Valley. Living in France prior to her MBA, HEC Paris was the only business school she applied to. It was pretty much HEC or bust. At HEC, Ashley networked with leading women in tech, brought on campus to speak candidly about their experiences in the field. “I do not think I would be where I am now without the HEC Paris MBA,” she says. “For me, HEC is the only school in France that’s recognized, not only outside of France, but outside of Europe as well. “If you look at the number of resumes Google receives each year, it’s millions. The HEC Paris MBA allowed me to get on Google’s radar. Before her MBA, Ashley (pictured below) worked for a price comparison technology startup in France. She joined as employee number three. By the time she left four years later, the company had grown to a couple of hundred employees, but only around 10% were women. Still, Ashley is confident about the future for women in tech. “I’m optimistic,” she says. “I think we will see more women in tech, and it’s because of big companies like Google stepping up, saying things need to change, and investing in things to make it happen. National organizations like Girls Who Code are trying to address this problem. According to the US-based non-profit, there will be 1.4 million jobs available in computing-related fields by 2020, but women are on track to fill just 3% of them. Sponsored by the likes of Microsoft and Facebook, Girls Who Code runs training programs and after-school clubs for teenage girls interested in tech. Over 10,000 of them are now majoring in computer science at top universities across the US. As the world’s leading tech hub, Silicon Valley is at the forefront of efforts to get young girls into technology, address historical gender bias, and alter the trend of men hiring men. 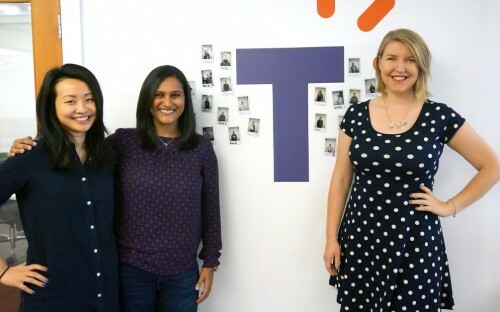 Mihika landed a job at Talkable, a software startup in Silicon Valley, after her MBA. She’s one of three HEC Paris MBAs in the office. She was the second to join, after her colleague Summer. Startups have an important role to play in establishing a more diverse, grass roots culture to empower women in tech. At Talkable, the gender split is 50-50. But when Mihika got her first tech startup job just out of undergrad, she was one of only two females in the office. What advice does she have for budding women in tech? “Don’t be afraid to take that first step,” she says.